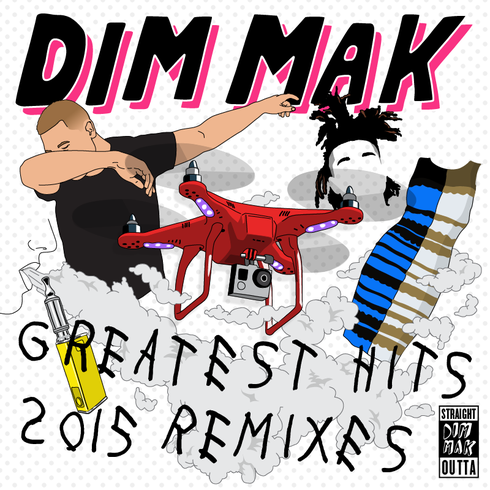 Dim Mak’s ‘Greatest Hits 2015: Remixes’ offers a selection of the best remixed tracks to come off the label from the past year. A collection of tracks ranging from progressive and electro to trap and dancehall (and everything in between), the compilation features artists like Keys N Krates, SBCR aka The Bloody Beetroots, Chris Lorenzo, Nom De Strip, Yellow Claw, Autoerotique, Lil Jon and many more. Containing 23 remixes, the compilations pays homage to the label’s distinct proclivity for putting fresh spins on proven originals. This year, international tracks like Blasterjaxx’s ‘Forever’ and Botnek’s ‘Tremors’ received remix treatments, as did Torro Torro’s remix of Autoerotique and Max Styler’s ‘Badman’, which has surpassed 5 million plays on SoundCloud. Also included are several previously unreleased tracks, like the JiKay remix of Keys N Krates’ Dum Dee Dum’ that's racked up 62 million plays on YouTube. The collection also features reworks from Dim Mak’s brightest producers, including Retrohandz, Panic City, Max Styler and head honcho Steve Aoki. Every remix aims to push the boundaries of its original predecessor. Whether it’s WRECKVGE flipping Garmiani’s ‘Zaza’ into Habstrakt adding his signature bass house wubs to Dirtyphonics & UZ’s ‘Hustle Hard’, each remix embodies Dim Mak’s ability to transform its own music.